On Sept. 20th, 2016, NBTU presented its 15th Annual First Cast Day at the Marin Civic Center Lagoon. Thirty-five youngsters rotated through the six stations, learning the basics of: Reading The Water, Gear & Rigging, Knot Tying, Fly Tying, Fly Casting, and Spin Casting. During this time, George Starn conducted a casting clinic for the 30 adults, which not only taught them how to cast a fly line, but how to "coach" their kids. This was followed by a raffle with 14 of the kids winning fly fishing prizes, including three rod/reel/line combos, a landing net, four fishing vests, and numerous boxes of flies, and then a sumptuous BBQ lunch put on by Mike Cronin and Linda Perone. 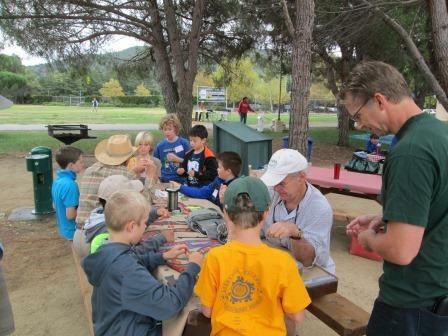 On Sunday, Oct 4th, we offered our first follow-up session at the Marin Cheese Factory where the kids practiced their knot tying and fly casting skills, and hook, land, and release numerous Bluegill and small Bass. On Sunday, Oct 11th, we conducted a second follow-up session at Putah Creek where kids reinforced their reading the water knowledge and learn nymphing skills. A six-minute video created by Ed Dudkowski can be found on You Tube: First Cast 2015. The weather on First Cast Day was perfect, no wind, but a bit on the warm side at about 95 degrees. Of the 25 staff members this year, only 9 had ever helped with First Cast before, yet they did a magnificent job. Mary Tealdi and Gene Hardesty appeared to have the kids learning how to find ‘fishy waters’ on Canvas Creek, while Dan Habig, heading up the Tying Station, was helped by an experienced crew of Zach Sovereign, Rick Pimental, and Bob Vasser. Fred Bellero took on the Casting Station, ably assisted by Michael Bland and Bob Justice. Lelia Lanctot headed up the Gear & Rigging Station with excellent help from Ryan Wilson. Brian Stompe and Steve Cochrane did a super job of teaching the key knots, and Peter Mangarella assisted by Wally Rentsch, did a fabulous job of initiating our first ever Entomology Station. Peter also helped collect some insects at Putah Creek on Saturday. . For the Adult Casting; with Maestro George Starn gone to Europe, who always does a magical job of teaching adults, and Fred Mack and Chuck Schultz both in Montana, the only other experienced professional educators who have helped with that important station, I surmised that the only person really qualified for that job was myself, having taught FF 101 to adults for the past 26 quarters at COM. Pairing them up so they would learn to ‘Coach’ each other, even the most unathletic parents were executing perfect tight loops by about 10:45. We then went over to the water to apply their Pull- - - - - - - - - Flick skills to a Pickup/Laydown 4 count cast, and then learned how to Roll Cast effectively, such that all of them felt confident in their being able to help their kids. A couple of the parents indicated they would go over to FishFirst to acquire some Rod/Reel Combos for their kids (and themselves). Following the group photo at about 12:20, the kids enjoyed winning FF prizes in the raffle, which featured 2 rod/reel Combos, 5 vests, 8 fly boxes w/flies, 2 nippers, which meant the majority of the participants won something. Highlight of the day, however, was the incredible BBQ lunch prepared by Mike Cronin and Linda Perone. Mike’s marinated chicken thighs and Linda’s veggie salad especially were huge hits with everyone. They were helped by NBTU member but non fly fisher Rich Moore. We met 3 youngsters and 3 parents at 0900. They set up and strung the rods and tied on their flies, and in 2 hours proceeded to catch a total of 18 Bluegill to 5”. Ably assisted by Satchel Daly, a 14 yr old HS studentcurrently enrolled in our COM FF 101 class, who did a great job interacting with the 3 youngsters, and helping coach their casting skills along with their trained parents. At 0900 John Overton and I met 4 kids and 3 dads on Putah Creek. Got them into wading gear and rigged up, taught them the use of a wading staff, and proceeded to teach the 2 most basic nymphing skills; High Sticking and Long-Line Indicator Nymphing. By 1:00 p.m. all had not only mastered those skills, but they’d had 3 grabs, and we had to literally pull them off the water as they wanted to continue practicing and refining their Indicator Nymphing skills. These are definitely all future fly fishers. Thanks again to those of you whose efforts contributed to this successful program. On Sept. 20th, NBTU presented its 15th Annual First Cast Day at the Marin Civic Center Lagoon. Thirty-five youngsters rotated through the six stations, learning the basics of: Reading The Water, Gear & Rigging, Knot Tying, Fly Tying, Fly Casting, and Spin Casting. During this time, George Starn conducted a casting clinic for the 30 adults, which not only taught them how to cast a fly line, but how to "coach" their kids. This was followed by a raffle with 14 of the kids winning fly fishing prizes, including three rod/reel/line combos, a landing net, four fishing vests, and numerous boxes of flies, and then a sumptuous BBQ lunch put on by Mike Cronin and Linda Perone. On Sunday, Oct 4th, we offered our first follow-up session at the Marin Cheese Factory where the kids practiced their knot tying and fly casting skills, and hook, land, and release numerous Bluegill and small Bass. On Sunday, Oct 11th, we conducted a second follow-up session at Putah Creek where kids reinforced their reading the water knowledge and learn nymphing skills. A six-minute video created by Ed Dudkowski can be found on You Tube: First Cast 2015. This year’s First Cast Day, NBTU’s 14th annual, was held at the Marin Civic Center Lagoon in San Rafael on Sep 21, and represents one of the most successful youth introductory fly fishing programs in the nation. Co-sponsored by Fish First Fly Shop in Albany and the French Cheese Factory on the Petaluma-Pt Reyes Rd., this year’s event had 114 participants, including 42 youth between 8-15 years of age. Youngsters were divided into six groups and assigned to begin at one of the six stations, then rotating every 30 minutes to the next station, country-fair style. The stations included Reading the Waters, where participants were given small trout cutouts and following input, were asked to place their fish on a 10’ X 14’ tarp painted to resemble a creek, with riffles, tailouts, runs, holes, undercut banks, etc. A discussion followed the placement of each fish, reinforcing the concepts which result in 5% of the water containing 95% of the fish.